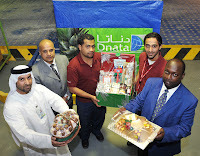 Dubai, U.A.E., 19th March, 2009 – Mothers in the UAE are set to celebrate their special day with more chocolate than ever before after Dnata Cargo handled its largest single shipment of the sweet treat. A whopping 115 tonnes of chocolate, with a value of AED 1.3 million, was flown into Dubai on a special B747 charter from East London in South Africa last week. Because of the already soaring daytime temperatures in Dubai, Dnata Cargo wrapped the delicate cargo in thermal blankets for its journey from the aircraft to the terminal. “Chocolate is very sensitive to heat so it was vital that Dnata Cargo ensured as consistent a temperature as possible during the offloading of the cargo from the aircraft and subsequent transfer to the cargo terminal,” explained Jean Pierre.